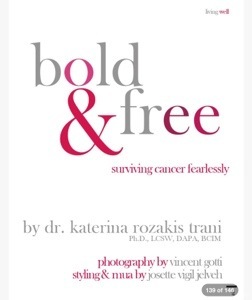 Bold and Free, Surviving Cancer Fearlessly. My Story Click on the link and scroll to Pages 138-143. If you know anyone going through a serious medical illness or diagnosed with cancer, please share with them my story. My affirmations helped me and I hope that they can inspire others. I am the sum of all the love that surrounds me. Thank you to all my family and friends for your support! I dance the gift of life! You are an amazing, beautiful woman. And such an inspiration. Your love and beauty shine out from the glow within you! I feel bless and full of gratitude. Thank you. It’s a challenging journey. I had to pull in all the accessories to help me keep up my spirits but the one thing that kept me going was my positive thoughts and having seen so many people go through so much in life worse than myself I felt blessed to have an opportunity to do something to survive. Happy to have caught it when I did. 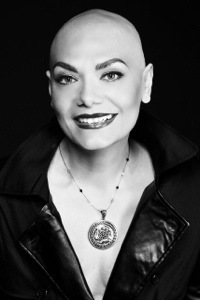 Seriously, I have not seen a hairless woman look so beautiful. And I mean in all regards, physically and in spirit. Holistic Wayferer Thank you, see my comment to you above.